From our perspective on Earth, as celestial objects move around our sky, it can be very interesting. They can be seen directly opposite each other, or appear in the same part of the sky, or passing in front of another or even blocking the one behind it from our view. Opposition comes from the word opposite. During an opposition, a planet is located at the opposite side of the Sun as seen from Earth. This happens when the Sun, Earth and the planet are in a straight line with our Earth lying in between. 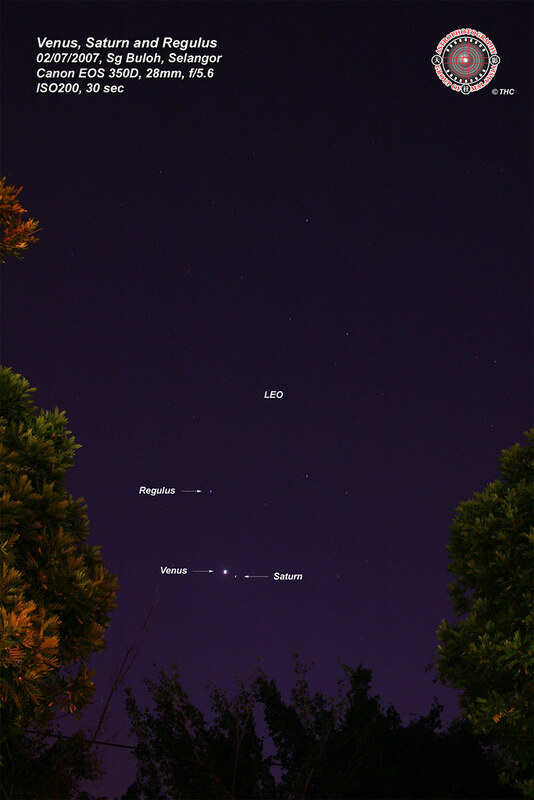 During opposition, a planet is visible in the east once the Sun sets in the west, and can be observed the entire night until the next morning. When the Sun rises in the east, only then the planet sets in the west. 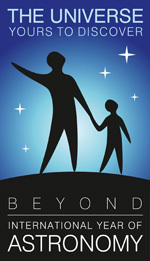 Also, this is the best time to observe a planet because it will appear bigger and brighter. 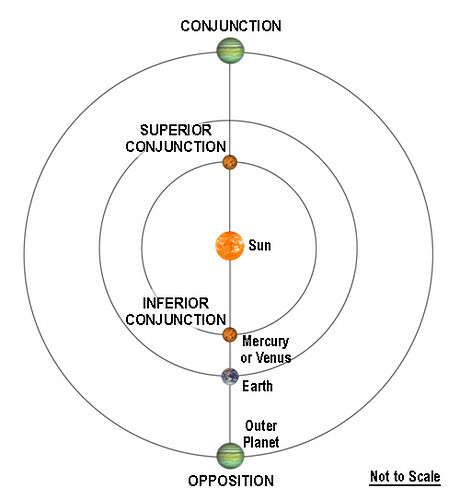 Inferior planets (Mercury and Venus) will never have opposition because that’s no way our Earth can be located between them and the Sun. Conjunction in simple words means “meeting” of two celestial bodies in our sky. As seen from Earth, these two objects appear near one another in the sky. They appear near only because of our perspective. In reality, they are very far apart in space. It can be conjunction of the Sun and a planet (during this time we cannot see that planet because it is in the same direction in the sky as the Sun), or conjunction between two planets (such as Venus and Saturn), or between our Moon and a planet. When a more distant object is blocked by the movement of a nearer object across our line of sight, we called that an occultation. Occultation is a kind of conjunction. There are so many types of occultation; occultation of stars by our Moon, occultation of planets by our Moon, occultation of a star by a planet, occultation of a planet by a planet etc. If you are interested in the events of occultation, then visit The International Occultation Timing Association. Occultations can be important events, because they can reveal much information about the objects involved, such as details may be determined of any possible traces of atmosphere of the nearer body. An example is the discovery of Uranus’ ring system during observations of a stellar occultation by the planet. Actually the observations were planned to use the occultation event to study the planet’s atmosphere. Instead, they found rings around the planet. Transit happens when a smaller celestial body or its shadow passes across the disk of a larger celestial body, whereby it is unable to totally cover the object behind it. Mercury Transit or Venus Transit is such example. As Mercury or Venus passes in front of the Sun, and since both are so much smaller compared to the Sun, they only appear as a black dot moving across the solar disc. Another example is the transit of Jupiter’s moons and their shadows across the globe of Jupiter. A rare case is a planet transit in front of another planet. Transit is also a useful tool in astronomy. For example it can use to determine the composition of a planet’s atmosphere or even be used to detect extrasolar planets. An eclipse happens when one celestial object moves into the shadow of another. The most familiar eclipses are the lunar eclipse and solar eclipse. A lunar eclipse occurs when the Moon moves into the shadow of our Earth. However, the familiar solar eclipse should be more correctly referred to as an occultation rather than an eclipse. As our Moon moves in front of the Sun, it is blocking out a portion or the whole solar disk. Hence the Moon is occulting the Sun and not eclipsing the Sun. Anyway, that name is stuck so we have to go along with it. Eclipse is not only limited to our Earth-Moon-Sun system. An eclipse also happens when a moon moving into the shadow cast by it parent planet or a moon passing into the shadow of another moon. These events can be quite easily observed within the Jupiter’s system. ~ by thChieh on June 17, 2008.